In many parts of the U.S. grubs are among the most common and most damaging yard and garden pests. Various species of beetles will lay their eggs into the soil of lawns and gardens from which develop grubs that feed on the roots. The most common across the U.S. is the Japanese beetle, but others may also include the northern masked chafer, the Asiatic garden beetle, European chafer, green June beetle, May and June beetles, and Oriental beetles. Grubs are dirty white with a brown head. They have soft bodies ranging from 1/16 inch to 1 1/4 inch long depending on stage of development. Most have six well-developed legs, except the green June beetle grubs. When disturbed, grubs will curl into the shape of a C.
Grubs feed on the roots of grass, causing the grass to wilt, brown and die. Patches of dead grass can be a sign of grub feeding. 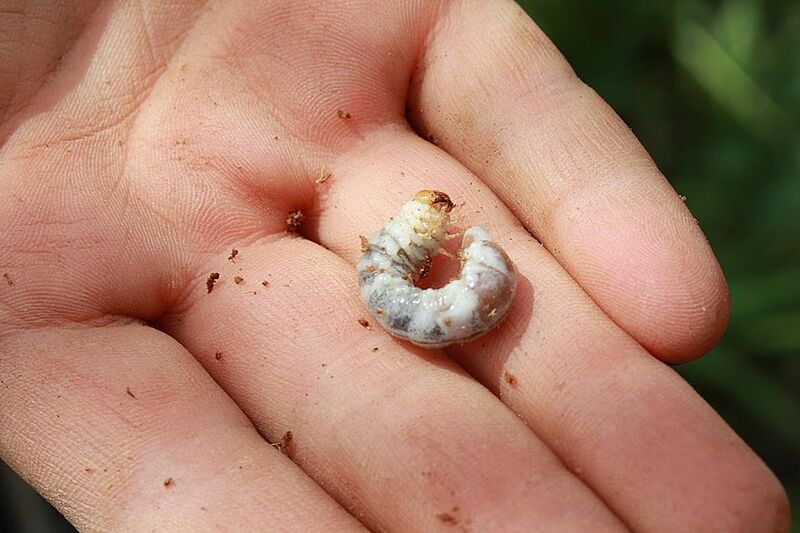 To determine if grubs are present, peel back the area that is damaged and inspect for grubs. Because the grubs have been feeding on and destroying the roots of the grass, the patch will easily pull away from the soil below if it is grub-damaged. The grubs are most likely to be found on the edges of the dead patch as they continue to feed on the roots of still living grass. Wildlife will often feed on the grubs, thus the sighting of skunks, raccoons, crows or other critters digging into the lawn, particularly at night, can be an indication that grubs are infesting the lawn. The first step in control is identification of the grub species as some biological controls are effective on only some species. For example, homeowners can purchase a bacterial milky disease for control of Japanese beetle grubs, but this is the only grub against which it has much or any effect. The downside of the bacterial agent is that it may take up to five years to become established, but it will lose its efficacy if an insecticide is used in the area. Pesticide Precautions: When using any pesticide read all labels or cautions as to use; use only pesticides labeled for the intended use (e.g., Japanese beetles or grubs, the plant on which the pesticide is to be used, the intended soil application, etc. ); follow all label directions; and keep and store all pesticides safely away from children and pets. Avoid using pesticide sprays in windy conditions and/or when bees are foraging.